Groom goes FREE at Sandy's Menswear! Welcome to Sandy's Menswear we are celebrating trading for 53 years in New Malden this year. The store was opened by Edward Sandy in 1955, father of the present owner Patrick, who himself has served 38 years in the business. The business has grown over the years to one of Surrey's leading menswear stores and is well known by many local residents, and prides itself on quality, selection, value for money, and excellent personal service. We would like to introduce you to our wedding hire service. Listed below, and at the top right of this page are the wide variety of wedding suits we offer for hire, all available in great, no hidden extra, packages which complete the perfect outfit! Our range of patterns and colours for waistcoats and neckwear are vast, and so we recommend you visiting the shop in person to view the whole range. On any wedding party where 6 or more of the party hire from Sandy's Menswear, the groom will receive his outfit at no charge. Read full terms and conditions here. Unlike other menswear hire shops, Sandy's Menswear does not have any "hidden extras". The package you see listed is the package you receive, and all at a great price! 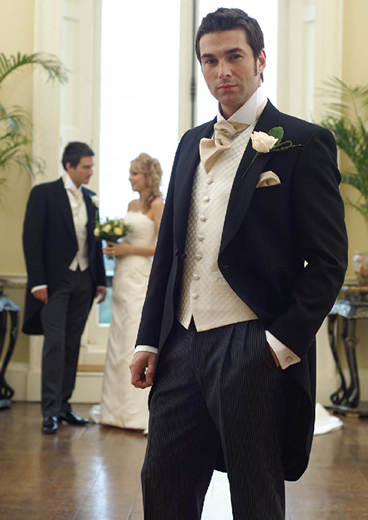 Tailcoat Suits - "Smart, but classic.."
Read more about our Tailcoat Suit Package and sample outfits. Prince Edward Suits - "A modern choice.."
Read more about our Prince Edward Suit Package and sample outfits. Frockcoat Suits - "A formal, full length style.."
Read more about our Frockcoat Suit Package and sample outfits. Lounge Suits - "The ideal choice for wedding guests.."
Read more about our Lounge Suit Package and sample outfits. Highland Wear - "Traditional Scottish outfit.."
Read more about our Highland Wear Package and sample outfits. View photos of our waistcoats and cravats, and popular combinations of the two.